Secrets from World War II may have been found in a coded message attached to the skeleton of a carrier pigeon found in an English chimney. 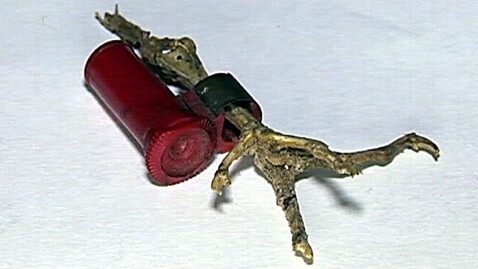 The bird was found when David Martin in Bletchingly, Surrey, was renovating his fireplace. Martin told the BBC that he began "pulling it down, pulling it down…then the pigeon bones began appearing one by one by one. Down came the leg with the red capsule on with a message inside." Martin called the discovery unbelievable and his wife was so delighted with the 70-year-old surprise she said it was like "Christmas." Theories suggest the bird was making its way from behind enemy lines, perhaps from Nazi occupied France during the D Day invasions heading toward Bletchley Park which was Britain's main decryption establishment during World War II. Others say the bird likely got lost, disorientated in bad weather or was simply exhausted after its trip across the English Channel and landed in the Martin's chimney. More than 250,000 carrier pigeons were used in World War II. They were called the National Pigeon Service and were relied on heavily to transport secret messages. During the war the Dickin Medal, which is the highest possible animal's decoration for valor, was awarded to 32 pigeons, including the United States Army Pigeon Service's G.I. Joe and the Irish pigeon Paddy. Government code breakers are working to read the message found in Martin's chimney. Colin Hill from the Bletchley Park pigeon exhibition told BBC, "I thought no way on earth can I work this one out." They have determined so far that the message is from a Sgt. W. Stott and that it was written 70 years ago.